Cabernet Sauvignon by Celestial Bay of Margaret River. An elegant, stylish wine with mouthfilling palate, ripe berry flavours, firm tannins and good acid balance followed by a clean, lingering finish. Celestial Bay is the achievement of Michael and Kim O'Brien's long standing passion for wine, an adventure which led them to the Margaret River region in search of property most suitable for viticulture. Extensive experience making wine in the Margaret River region and time working in France have shaped the approach at Celestial Bay. Simply sublime with a roast leg of lamb under the traditional mint sauce. The perfect location was identified on Metricup Road, Wilyabrup. A former dairy farm, the site provides all the necessary requirements - good soil, a moderate maritime climate and reliable rainfall. This proximity to the ocean provides a moderating effect on the microclimate, reducing temperature extremes and ensuring a more secure water resource. The vineyard is moderately undulating, with a 5% gradient being the steepest slope on the property, and is situated at between 90 and 100 meters above sea level. The vineyard is set to a vertical shoot positioned canopy structure, allowing a machine harvest of the fruit. A block of the vineyard can be quickly picked, at the same level of ripeness. Fresh, un-wooded white styles are fermented in temperature controlled stainless steel vats. Maintaining temperatures during ferment at 14 - 16 C is essential to ensure that delicate aromatic flavour compounds in the fruit are preserved. Specific yeast strains that enhance these aromas are also used. Our aim is to bottle these wines early, capturing the essence of the fruit. These wines are made to be enjoyed within 2 years of bottling. The Chardonnay style is evolving as the vineyard matures. Previous vintages have seen a measured approach to the use of oak and wine-making heroics, as the fruit power required to absorb and meld with such characteristics had not yet developed. The oak component is gradually increased from year to year, putting components through barrel fermentation and lees stirring. More new oak will continue to build the level of complexity, while retaining finesse and structure, which has become an expected trait of Celestial Bay Chardonnay. Full-bodied red wines are made in the tradtional way utilising small open pot fermenters, employing intensive maceration techniques. Each ferment is hand plunged four times a day with twice daily pump-overs (where the fermenting juice is pumped from the bottom of the tank to be percolated through the skin-cap) ensuring that extraction of skin components is maximised. Pumping over also introduces oxygen to the process, stabilising and softening the polyphenol components we are extracting from the skins. Red wines made in this fashion show good colour and a more integrated tannin structure as young wines and have the potential for greater longevity. The intent is to ensure the extract of polyphenols is balanced to the level of fruit flavour and depth and that acidity adds freshness and definition, referring to the French approach that values structure and balance in wine over absolute power and depth. Red wines spend 12-18 months in oak barriques prior to final blending and bottling. Wine is stored in oak primarily to soften tannins and further stabilise polyphenol components in the wine. Red wines that have been properly conditioned in oak have a gentler, more complex tannin structure and will evolve in the bottle with less deposition of sediment than those that have not. The added sensory complexities that oak imparts should not dominate. 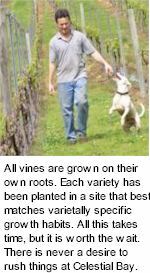 All vines are grown on their own roots. For the most part, each variety has been planted in a site that best matches varietally specific growth habits. Vigorous varieties have been planted in lighter soils that tend to be dryer, thereby limiting excess vigour. Less vigorous varieties have been panted in more fertile locations. All this takes time, but it is worth the wait. There is never a desire to rush things at Celestial Bay.